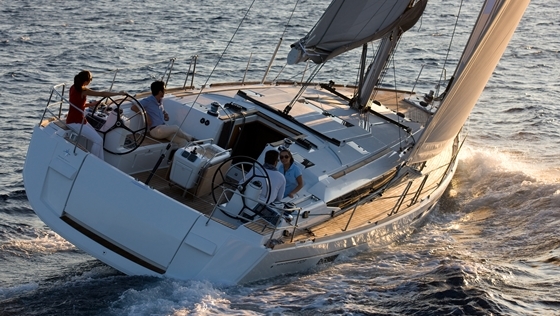 The brand new Jeanneau Sun Odyssey 490 changed in some familiar and some radical ways. The new hull is quite flat at the bow and the design carries her beam well forward with a long chine that starts about a foot back from the stem. This creates a voluminous forward stateroom and helps the model stay on her feet in a blow. But that’s relatively incremental underbody change. The real head-smacker came with a new deck mold that tossed out all preconceived notions of how a we move about on an aft cockpit sailboat. Standing aft at one of the twin wheels, you can walk all the way to the bow without stepping or climbing over anything, least of all, a cockpit coaming. You can then walk all the way aft down the other side and arrive at the other wheel, again, without obstacles. The deck slopes gently up and onto the main side deck. Drains by the pedestals are there to gather up any water spraying up over the bow and rushing down that slope toward the driver (In particularly snotty conditions, you’ll want to drive from the high side just in case that drain doesn’t quite get it all). Besides being easier on folks that don’t like to climb (young or old), the new deck helps with neck aches. If you’ve ever spent a couple of hours driving while sitting outboard, your body facing in but your head craned forward to see the headsails, you’ll appreciate that you can now sit with your whole body (legs included) facing forward. Your feet will be over that aforementioned drain and you can just drive, without once rubbing your neck and shoulders to relieve the tension. But the out-of-the-box thinking didn’t stop there. Designer Philippe Briand took the dead space traditionally found inside the cockpit coaming and made it earn its keep. You can now lift the settee backrests up and out to make a sunpad on either side. In the case of the starboard pad, it can extend all the way to the cockpit table (with a filler cushion). The table is now offset just a bit to allow nice walk-through passage from the drop-down transom all the way to the companionway. So not only does the 490 change how we move about on deck, it also changes how we use the deck at anchor. Looking to maximize comfort? No problem. But wait, hold on, there’s more. What do you do with the Harken primary winches if the coaming is mobile? You set them on pedestals inboard, of course. 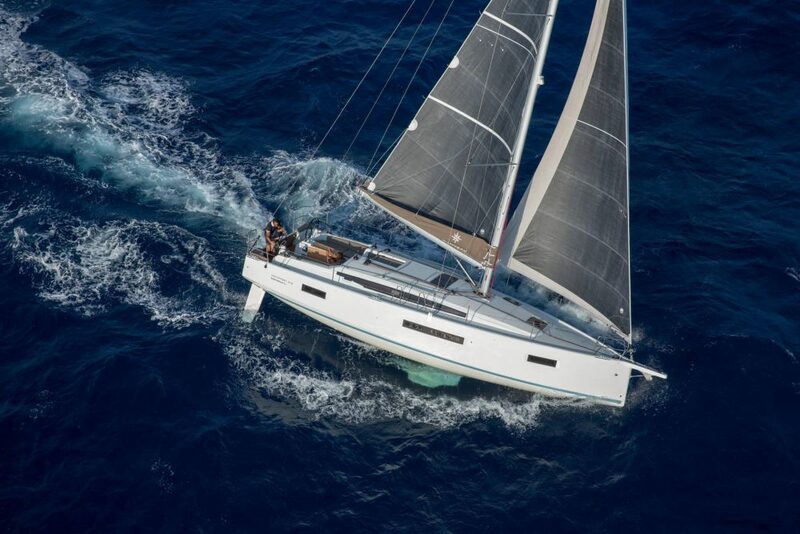 Besides moving the winch weight toward the centerline, the added benefit here is that crew can now face forward while grinding in genoa sheets and therefore actually seeing what the headsail telltales are doing. That’s a departure from many other designs that plops the winches where they are hard to access by anyone not at the wheel. The rig changed as well to what Jeanneau is calling a cathedral rig where the lower D1 and cap shrouds terminate at different chainplates—one on the outside and one on the coachroof. This keeps the side decks clear so it’s easier to walk from the wheel to the bow. The total upwind sail area is 1,188 square feet and we put it to work on a glorious sunny but windy day in Miami. With 16-18 knots of wind, we zipped around at 8.1 knots and 60 degrees apparent wind angle. When we rolled out the Code 0, that bumped up to 9.1 knots. This boat loves to point and we tacked through 70 degrees with a snappy response at the wheel. The Code 0 (and an optional asymmetric downwind gennaker) attach on the newly designed, integrated composite sprit that elongates the boat’s profile and moves the anchor well forward of the plumb bow to minimize stem dings. The 490 is one fun cruiser with 1,188 sq. ft. of sail area. Our test boat had inmast furling but a traditional hoist main is available in a performance package that also includes tri-radial Mylar sails and an adjustable textile backstay. You can even opt for composite wheels instead of the standard leather-covered stainless steel if you want to impress at the yacht club. Two things I found a bit awkward: First, is the foot brace that worked well when heeling but was a tripping hazard the rest of the time. A flip-up version would be welcome. The second was the positioning of the B&G multifunction displays that are angled outboard on the pedestals. That works well when the driver is seated but they’re nearly impossible to see from any other angle or position. The flat water of Key Biscayne didn’t give us a chance to test the flat forward hull section. It may pound going to weather in choppy seas but since we didn’t have those conditions, we just slipped along easily with the wake churning behind us. It was the kind of day you don’t want to end. When we finally headed for the dock, the upgraded Yanmar 80 (57 HP is standard) delivered 9.1 knots at 3100 rpm with a Flexofold folding prop. 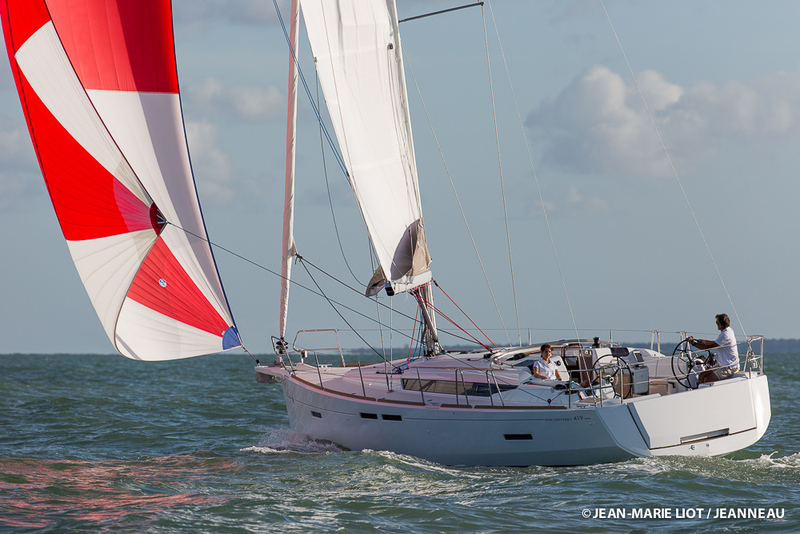 Jeanneau has kept the choice of engines under 100 HP to be able to offer their 360° Joystick Docking as an option. 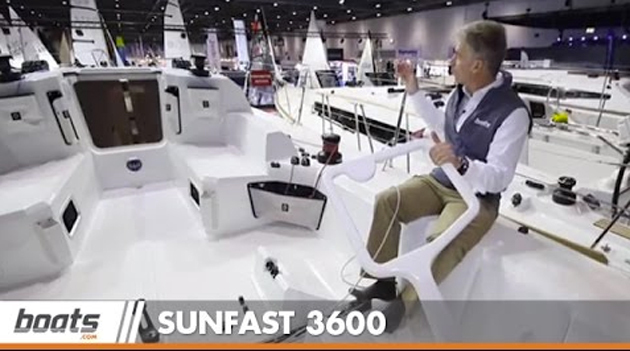 It’s hardly needed however, especially with the optional retractable bow thruster that makes tight quarters maneuvering easy even for new sailors. 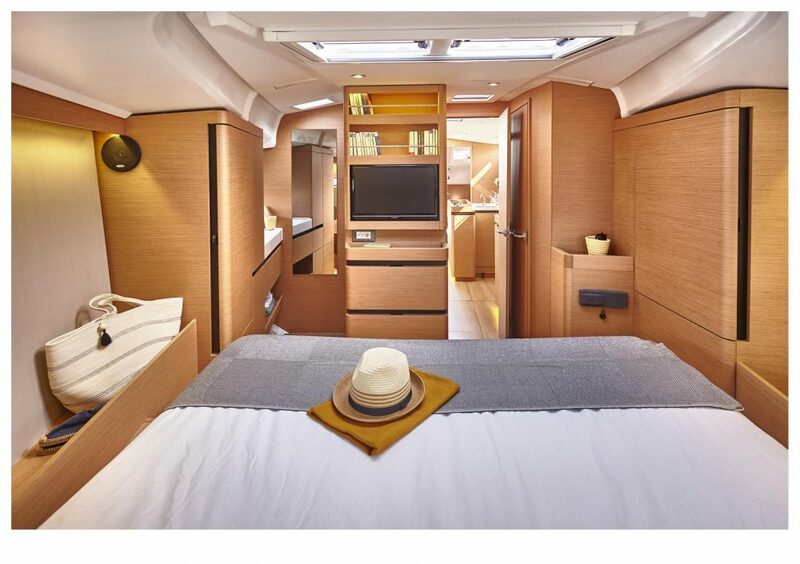 Fans of the new model is be pleased to learn that the 490 comes with three options for interior layout, varying from 2-5 cabins and 2-3 heads. Thought went into the accommodations as well. 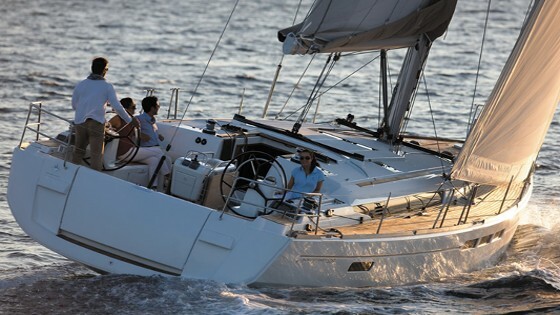 The Jeanneau 490 comes in three configurations with 2-5 cabins and 2-3 heads. 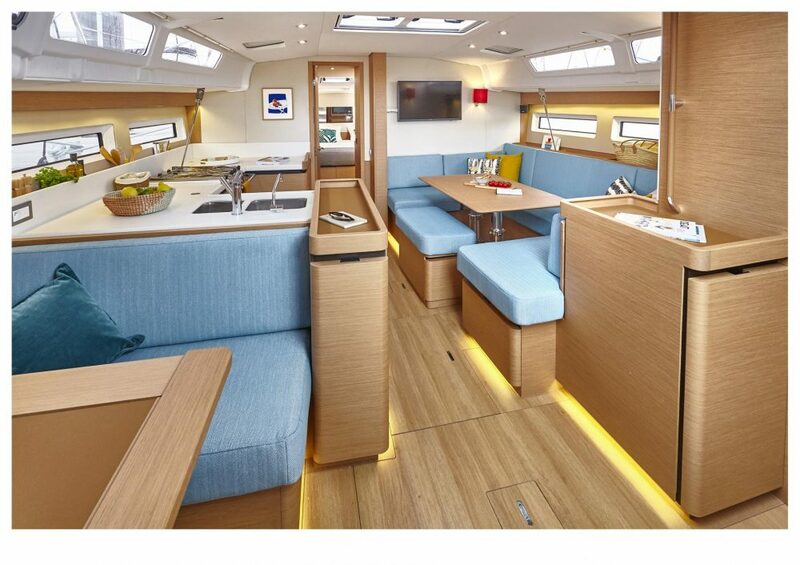 The center section with the saloon, galley, and nav desk remain constant and only the ends of the boat change. Our model was the owner’s version with the master stateroom forward. 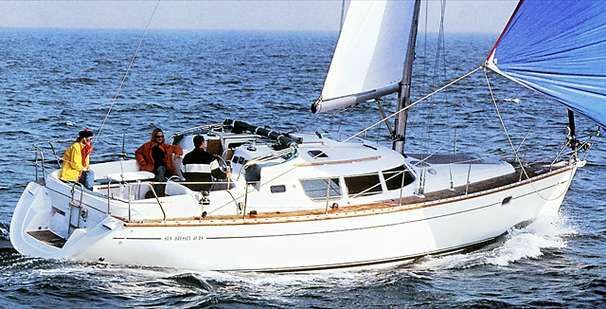 Jeanneau has reconfigured the split head with a head and sink to port and a separate shower stall on the centerline but another sink outboard. It’s nice to have a sink at each. 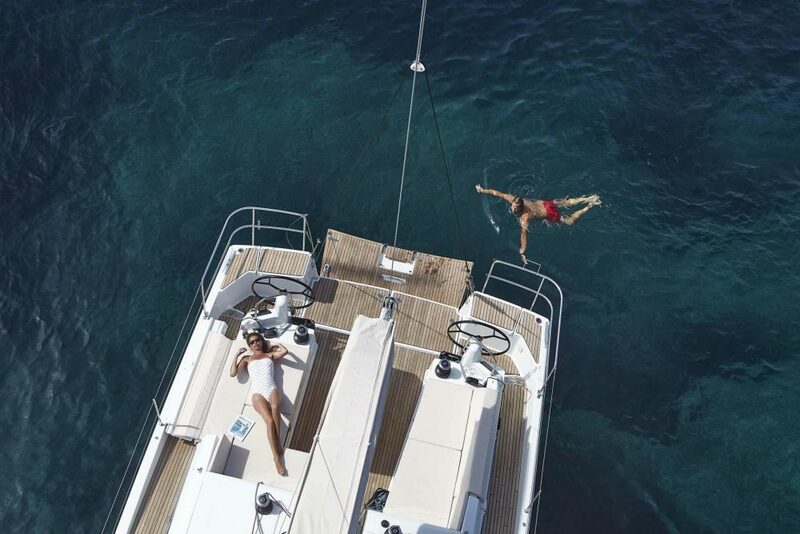 The suite is light and airy with fixed hull ports as well as twin overhead opening hatches. For the extra observant, you’ll notice that the bow can be split into two staterooms (the lines are visible in the deck mold overhead) so each of the the hatches above ends up in a different cabin and each bath becomes a complete wet head. 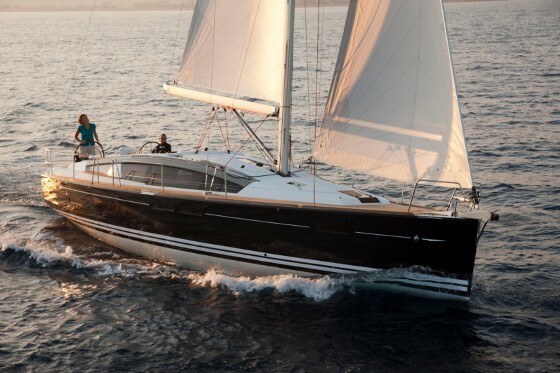 For charter work, the Jeanneau will most likely have five cabins with an over/under to port, just aft of the galley. But with that cabin not specified, there’s plenty of room for an impressive navigation station. The forward-facing nav desk is close to the companionway for good communications with the cockpit. It also forms a part of a small dinette with another bench seat between the desk and the galley. I’ve yet to see a double nav desk on any vessel in this class and it makes a great place to sit with a cup of coffee and discuss the day’s plans with your mate. The galley was reconfigured too so it’s not just nice at a boat show. This is a functional kitchen that can be used under way, even on a port tack. An island provides quite a bit of stowage space but also serves as a bracing point for the chef who will be able to use the sink underway and still have both hands free. There’s even an opening hatch directly over the three-burner Eno stove to vent cooking heat and odors. 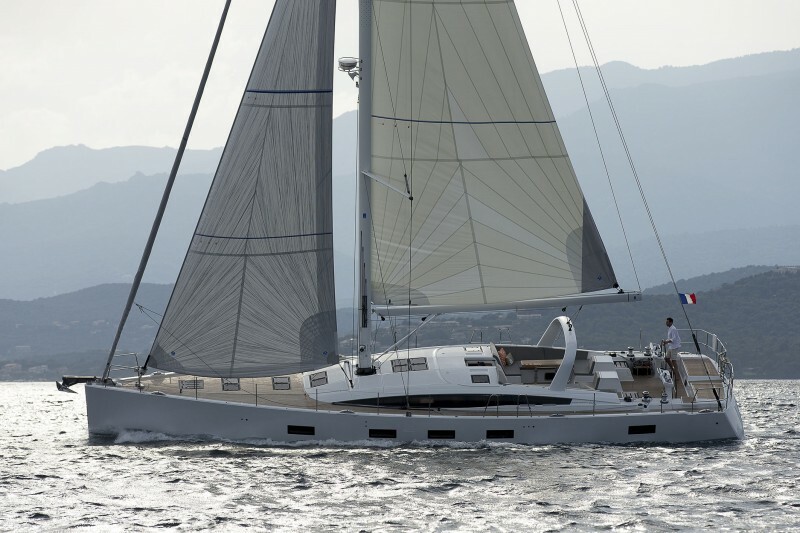 This design shows that someone at Jeanneau has spent time aboard, underway, feeding a crew. Owner rejoice! No need for custom sheets—on the 490 you'll find rectangular beds, on which you can use off-the-rack fitted sheets. Finally, this point must be made: The beds are rectangular just like back home so you can now buy off-the-shelf fitted sheets without having to make a template for custom sheets. That’ll save money as well as headaches. 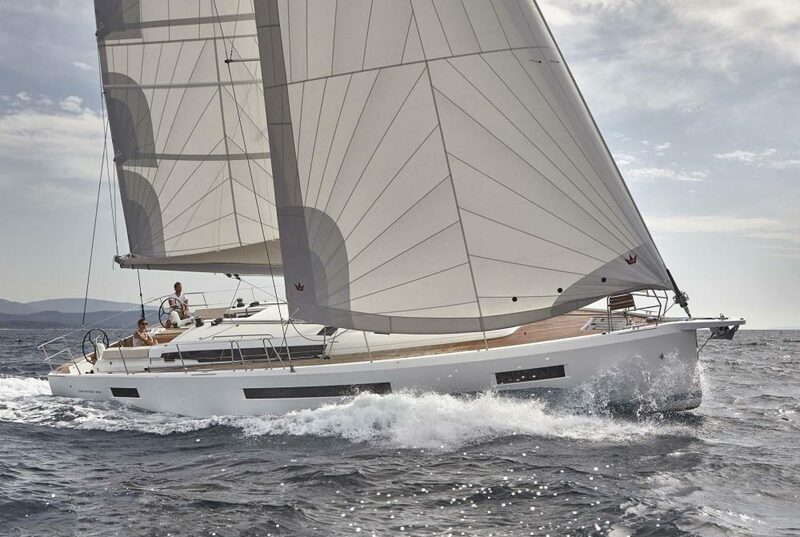 The Jeanneau Sun Odyssey 490 has a little sister that actually introduced the new deck and rig design at the Annapolis boat show earlier. The 440 was the first to change in the line. The 490 followed soon after and my guess is that the other seven models in the line will adopt these modification as well because these aren’t just changes for change’s sake, but actually enhancements of how we boat today. No, it may not have been you who thought of (and capitalized on) the cool new deck design of the 490 but isn’t it good to know that there are still new ideas out there and that innovation comes in unexpected packages? That this particular package can also sail like a witch is certainly a delightful bonus. Draft (shoal / deep) 5'4" / 7'4"
Sail area 1,188 sq. ft.